Adapted from Robert Rauschenberg’s 1959 drawing Sketch for Monogram, this print illustrates the thought process behind Monogram (1955–59), a noted Combine in the collection of the Moderna Museet, Stockholm. Here, that work’s infamous tire-wrapped goat is shown from multiple viewpoints in its final placement (one of three positions the artist considered), surrounded by various measurements and calculations. 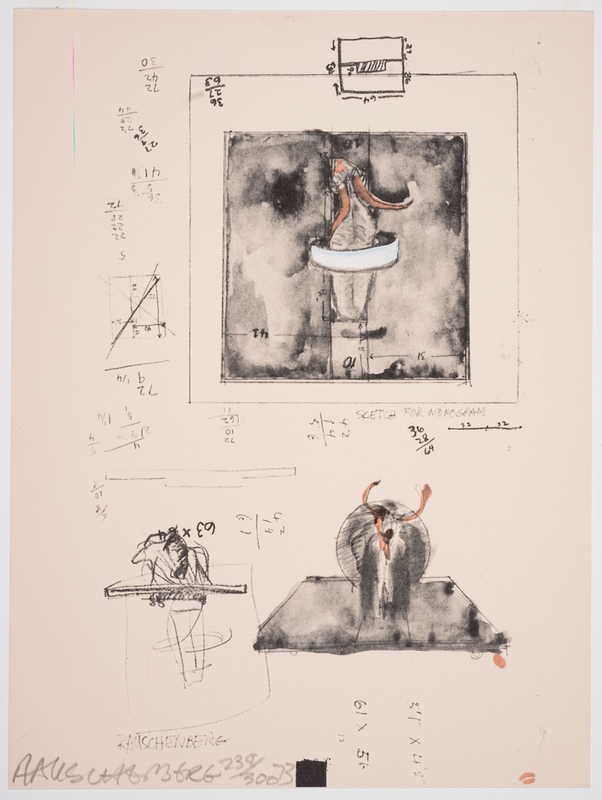 These notations hint at the difficulties of incorporating a goat as an art material without rendering the work gimmicky, a challenge Rauschenberg struggled with for more than four years. The sketches of the goat also highlight the artist’s draftsmanship, a skill that is generally not readily apparent in his Combines or other finished artworks. 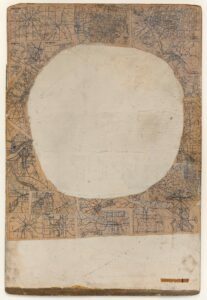 Sketch for Monogram, 1959 (1973) is part of the New York Collection for Stockholm, a portfolio of thirty prints that was produced in an edition of 300 by Experiments in Art and Technology (E.A.T. ), a nonprofit organization intended to promote technological advances in the arts. Cofounded in 1966 by Rauschenberg and performance artist Robert Whitman with engineers Billy Klüver and Fred Waldhauer, E.A.T. initiated an ongoing Technical Services Program that paired artists and engineers or scientists for one-to-one collaborations. 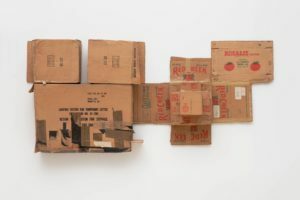 In the early 1970s the group set out to assemble a collection of works by thirty leading contemporary artists, which it would donate to a public museum. The Moderna Museet was selected as the recipient because of its strong tradition of collecting and supporting American art. The New York Collection for Stockholm portfolio, to which each artist slated for inclusion in the collection was asked to contribute a print, was produced to generate acquisition funds. Rauschenberg’s repurposing of his 1959 sketch for Monogram was an apt choice, given that the Combine already belonged to the Moderna Museet. 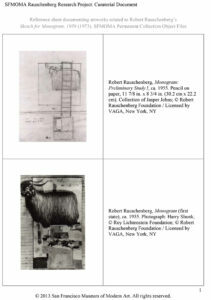 SFMOMA’s copy of the portfolio was donated by Rauschenberg in 1976. In addition to Sketch for Monogram, 1959 it includes works by Lee Bontecou, Robert Breer, John Chamberlain, Walter De Maria, Jim Dine, Mark di Suvero, Öyvind Fahlström, Dan Flavin, Red Grooms, Hans Haacke, Alex Hay, Donald Judd, Ellsworth Kelly, Sol LeWitt, Roy Lichtenstein, Robert Morris, Louise Nevelson, Kenneth Noland, Claes Oldenburg, Nam June Paik, Larry Rivers, James Rosenquist, George Segal, Richard Serra, Keith Sonnier, Richard Stankiewicz, Cy Twombly, Andy Warhol, and Robert Whitman. Barbara Rose, “The Swedish Connection,” New York Magazine, November 6, 1972, 90. This source provides general information about the portfolio. This listing has been reviewed and is complete as of August 31, 2016.